Wigan Athletic are hoping to be boosted by the addition of two ‘new signings’ by the end of the international break. 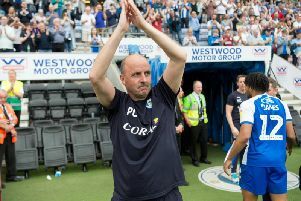 Latics are now without a fixture until the trip to Brentford on Saturday week, by which time centre-back Dan Burn and midfielder Darron Gibson should be back in the fold. Burn hasn’t kicked a ball in anger this term after sustaining a foot injury in the final pre-season friendly at Rangers in July. Gibson, meanwhile, sustained a hamstring problem during his Latics debut on the opening day of the campaign against Sheffield Wednesday. But both are making good progress behind the scenes, and assistant boss Leam Richardson says the fortnight’s break from league combat has come at the right time for them. “It’s still daily with Dan,” revealed Richardson. “Fingers crossed after the international break we should obviously be a lot closer, and we’ll expect him back within that time-frame. “But with those types of injuries you’ve always got to assess it daily, and we’ll be sure to do that. “It’s exactly the same with Darron, we’re taking it day by day. “They’re both improving all the time, and fingers crossed when we return from the international break they’ll be featuring in some sort. push his body closer to full fitness. “Joe’s worked so tirelessly hard since he’s been here with the fitness coaches and the sports scientists to get to where he is,” added Richardson. “He’s finally there and it was great to see him out there on the pitch.